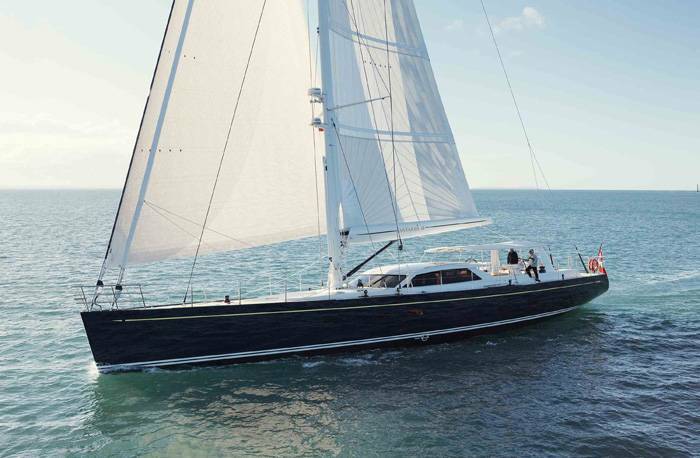 Antares III is a 30m (98ft) custom built composite performance cruising sloop from the design board of Dixon Yacht Design. 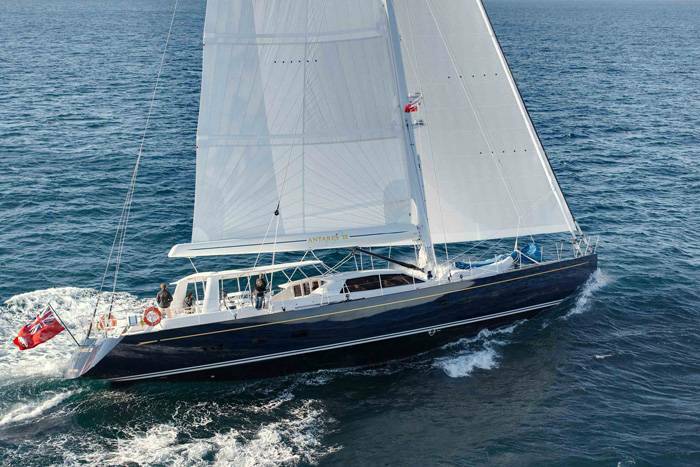 Built by Yachting Developments to meet and exceed strict Germanischer Lloyd and MCA classification survey requirements, the vessel is incredibly strong yet 25-30% lighter than similar vessels built in Aluminium. 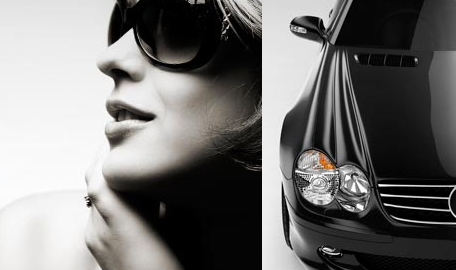 The composite structure is post cured epoxy Eglass/Carbon/Kevlar incorporating high strength foam sandwich technology. 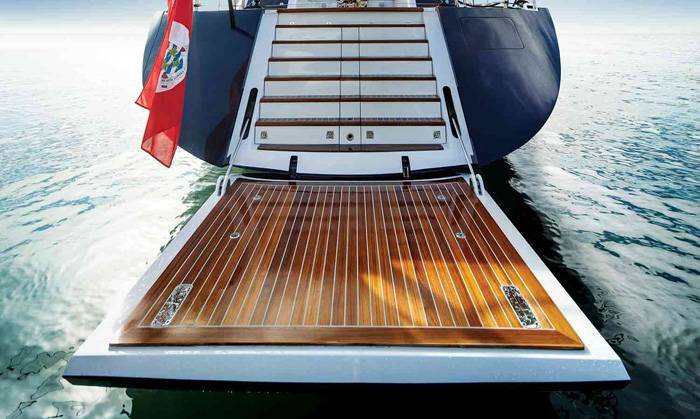 The hull has a Kevlar outer skin, for increased impact resistance. 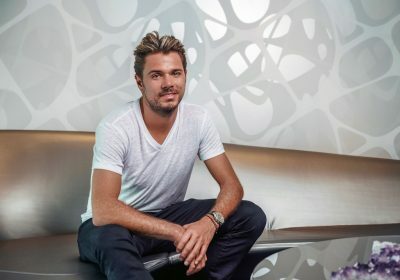 The owners design brief was to scale down the owner’s previous 40m yacht also designed by Bill Dixon which the owner felt to be to be a little too impersonal as it required a large a crew. 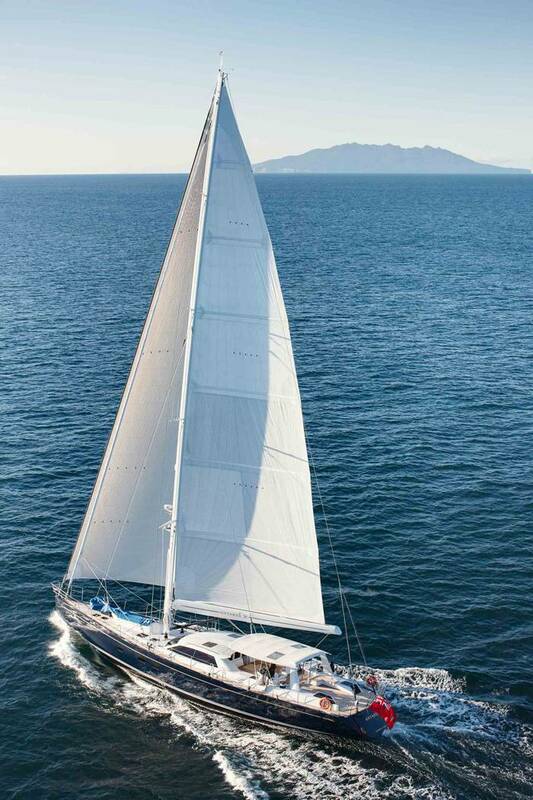 Antares III is well equipped, designed to cruise the world in comfort and be self sufficient for extended periods of time. 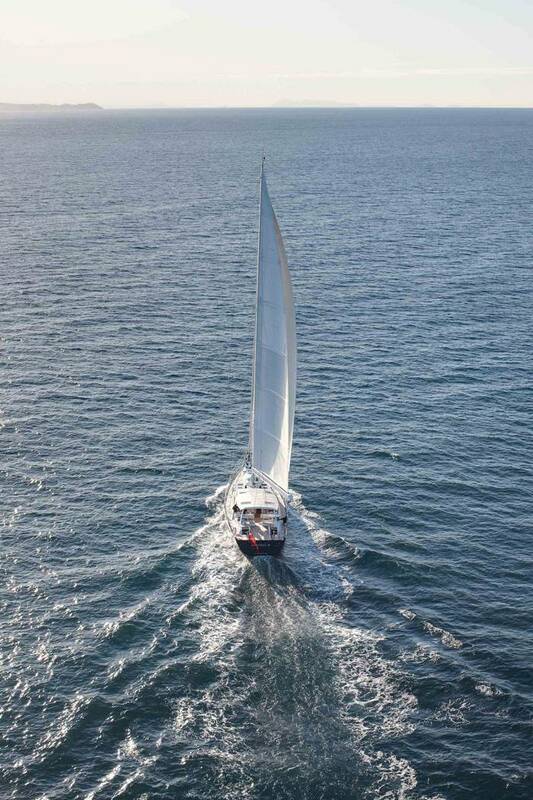 Lithium Ion batteries and efficient onboard systems provide extended silent ship mode for the vessel when sailing or at anchor in a quiet bay. 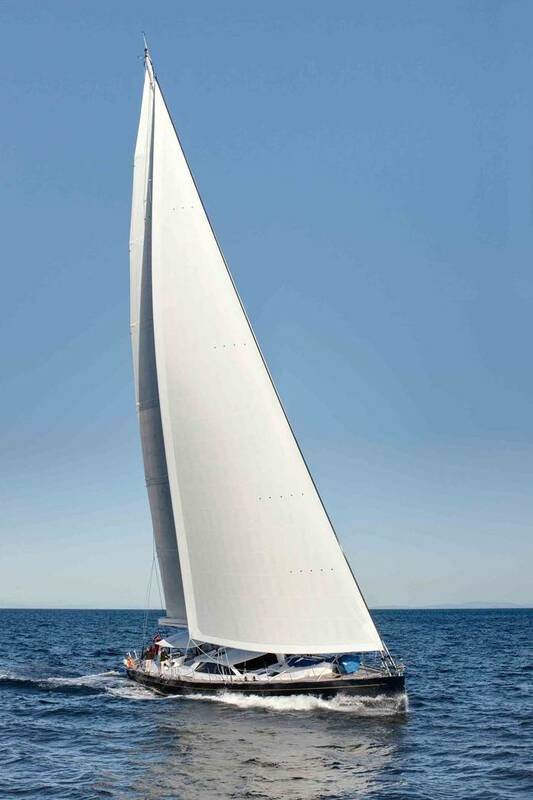 Antares III was constructed in less than 400 days, unprecedented for a custom vessel of this size and level of quality. The owner considered potential shipyards internationally, but the decision to award the build contract to Yachting Developments was made partly due the limited choice in high quality composite shipyards with experience in building vessels of this type and limitations on who would be able to deliver Antares III to the highest of quality within the short build time frame. Ian Cook, Yachting Developments Managing Director, flew to Europe to meet with the owner, the meeting was successful and resulted in the contract being negotiated and signed on the same day. Ian returned to the shipyard bearing news that Yachting Developments would be commencing build in 2010. 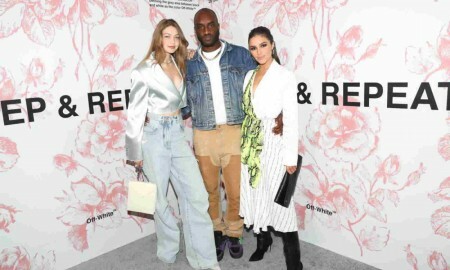 Given the state of the economy at that time, it was the perfect way to end the year and send the staff off on their annual summer vacation knowing that when they returned in 2010 it would be full steam ahead on the project. 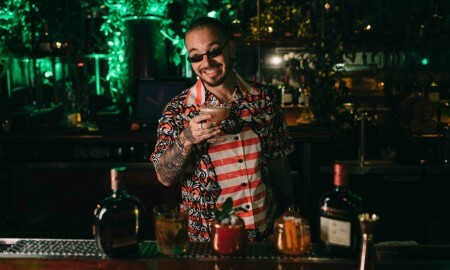 While this short build time is not the norm, Ian Cook and his team thrived on the challenge and with the expertise and knowledge within his staff it’s not a challenge they are likely to turn down in the future. The owner visited the project and took the opportunity to enjoy the nature and beauty of New Zealand on three occasions. For Patrick Yeoward, the Owners Representative, this was the third new build with this owner, so he knew him well enough to be able to make decisions quickly on his behalf. When Antares III was launched, the weather was not too forgiving and strong winds and rain were not ideal, but she was launched smoothly and on time. 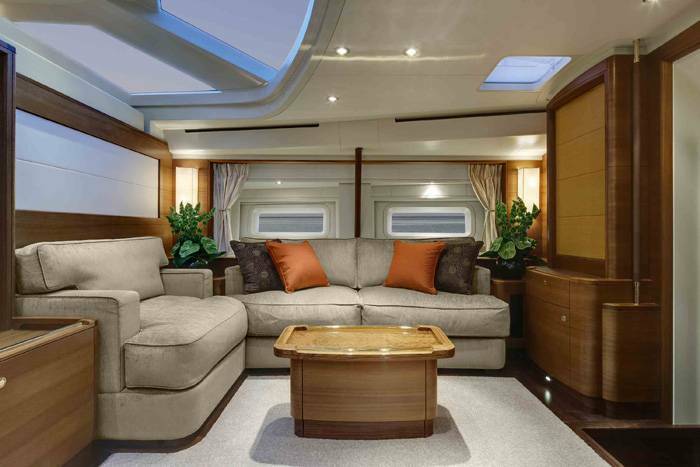 Comfort starts on deck, which is designed to have different socialising areas, with aft deck seating, the guest cockpit itself, and additional informal seating forward in the foredeck tender recess. 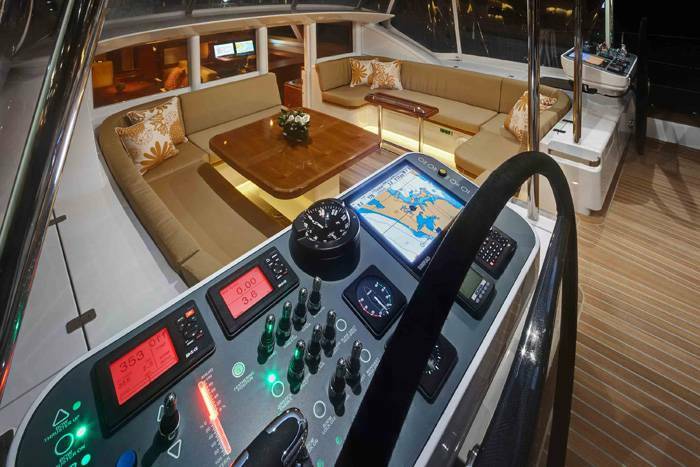 The interior layout focuses very much on the split level pilothouse, a focus point of the design; the aft windows and door fold away to give a cohesive indoor / outdoor living space with the guest cockpit. 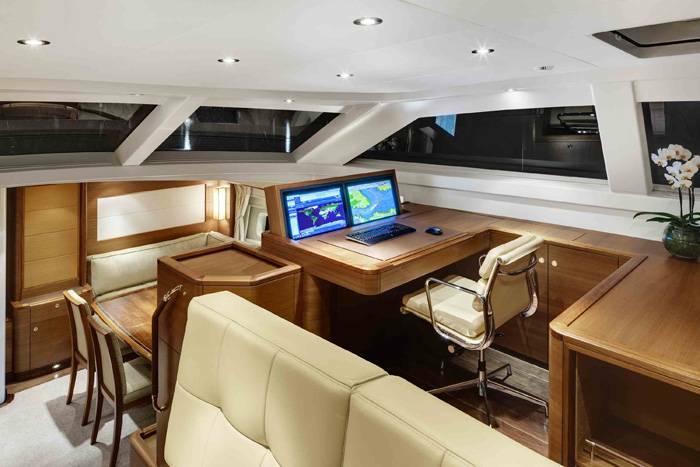 A carefully thought out living plan is essential on any yacht, and on Antares III the pilothouse configuration allows the integration of a ‘serious’ engine room, with full standing headroom, making maintenance both efficient and convenient. 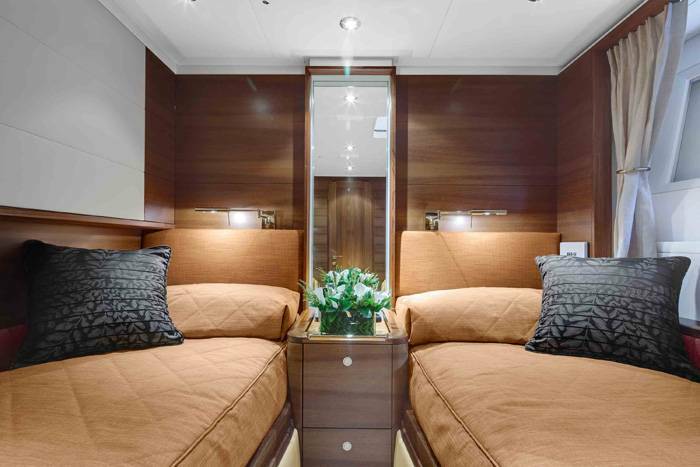 The challenge for Rhoades Young design was to create a clean and contemporary interior, whilst trying to avoid the usual trappings of modern styled yachts. 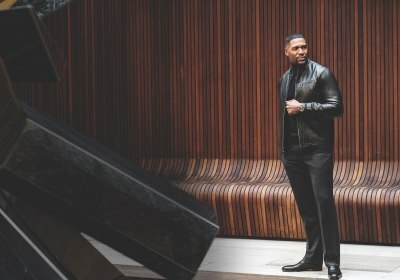 We combined modern furniture detailing and strong formal architectural symmetries with warm traditional woods and careful upholstery detailing” says Jonathan Rhoades. 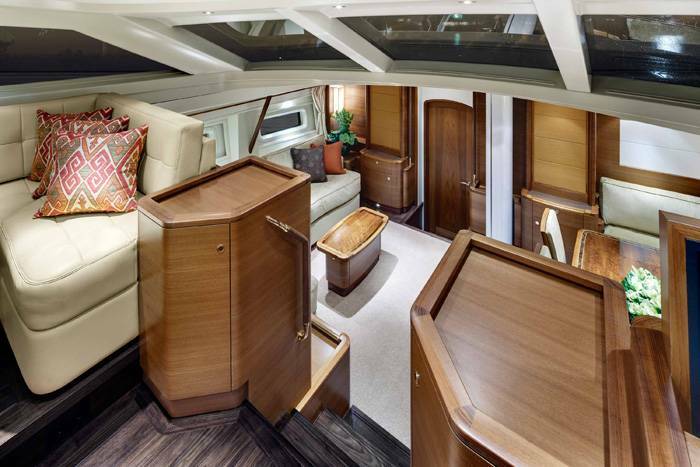 The horizontal grained blond teak interior designed by Rhoades Young was manufactured in-house by Yachting Developments specialist tradesmen. Muted tones and colours keep the interior calm, quiet and elegant. 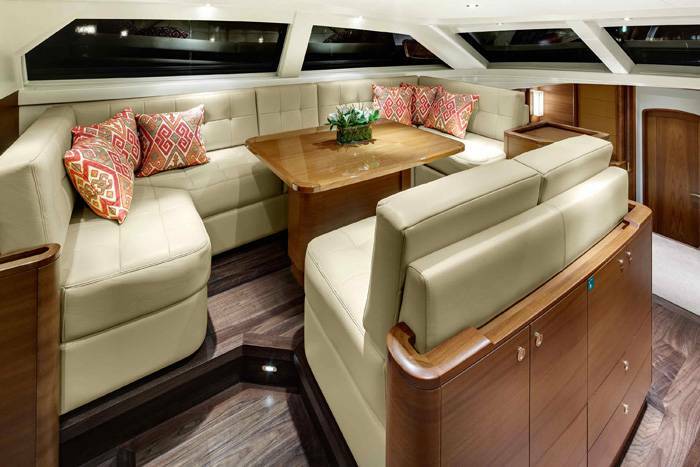 The pilothouse upper saloon is spacious, light, and airy. A raised settee and table to port allows all round vision while seated. 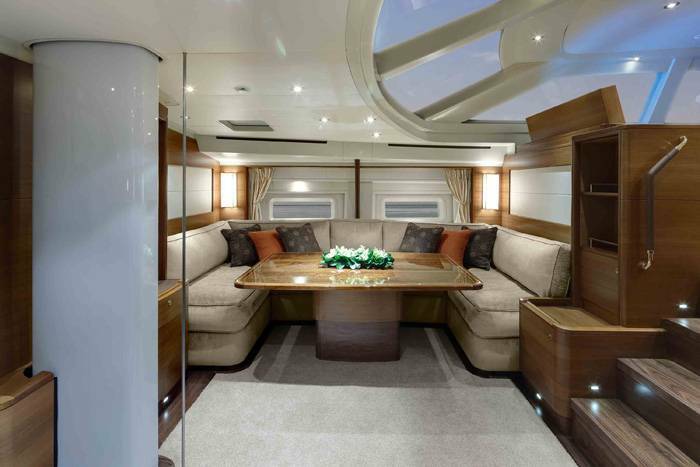 Large opening pilothouse windows aft allow interaction with guests and helmsman in the cockpit area. 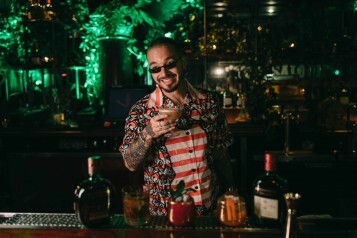 The navigation area and bar are located to starboard. 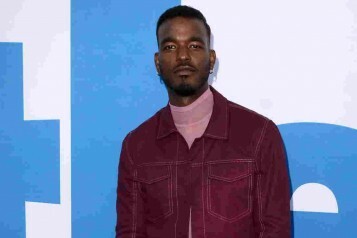 The lower saloon features a warm and comfortable atmosphere with large inviting armchairs, coffee table to port and pop up flat screen television. 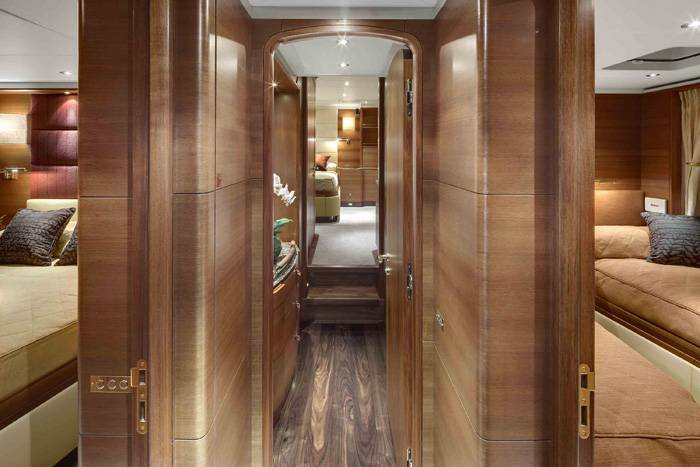 The lower saloon to starboard can be used as an open casual area, alternately in a matter of seconds it can be transformed into a formal dining area featuring high gloss walnut and gold inlaid dining table. 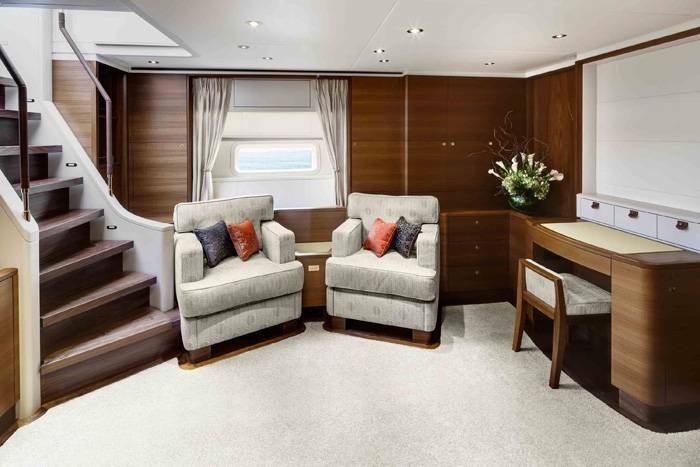 The spacious full beam master cabin features soft comfortable armchairs, generous sized ensuite and private access to the aft deck. 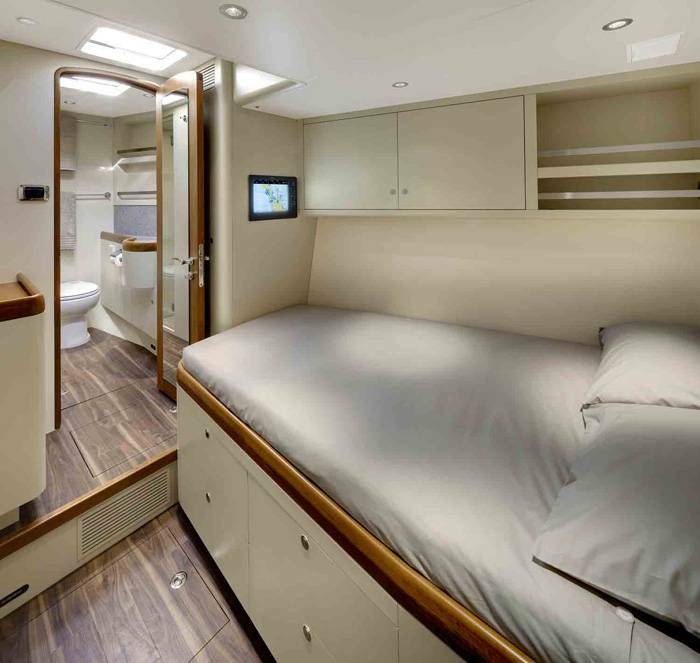 Natural light streams into the cabin through large opening skylight deck hatches and large fixed topside potholes strategically located throughout the cabin. 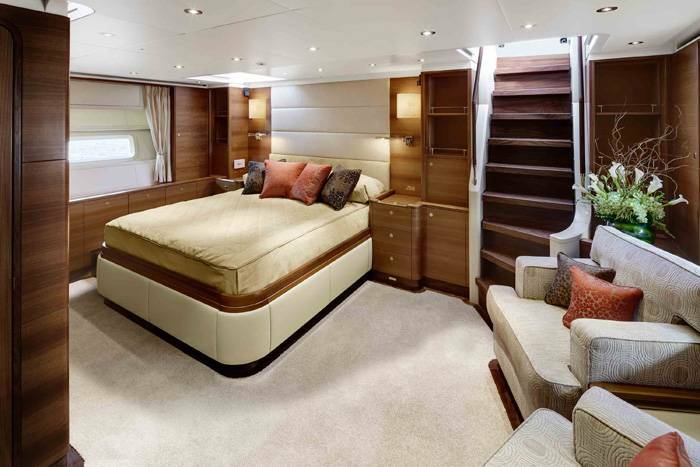 The guest accommodation is located aft on either side of the central companionway leading aft to the master cabin. 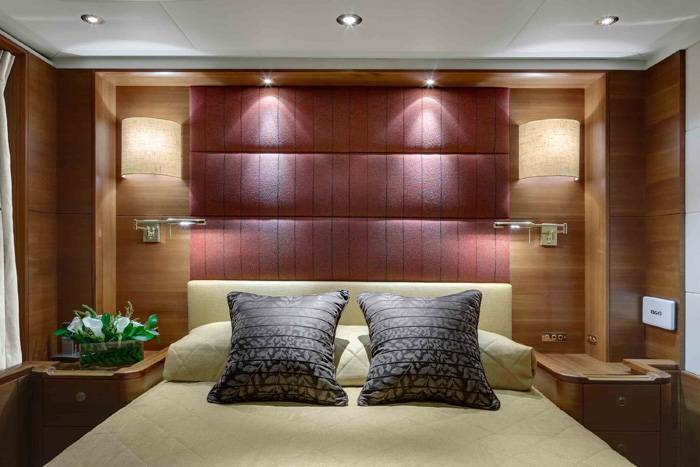 The starboard guest cabin features a double queen berth. 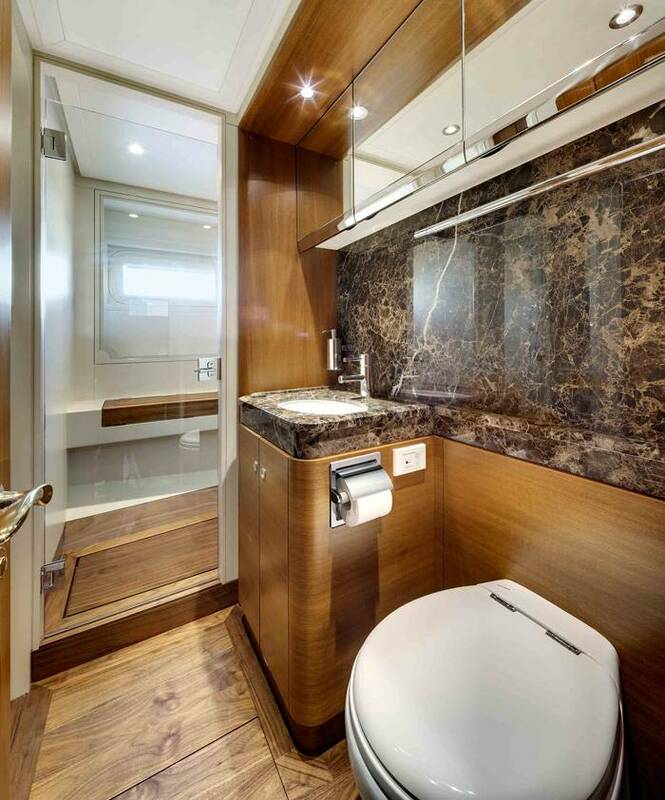 The port guest cabin features twin berths with a concealed optional third Pullman berth. 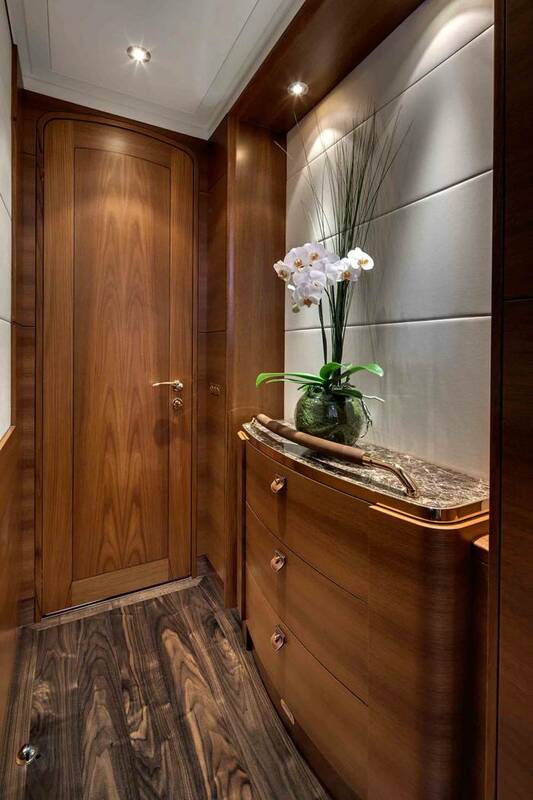 The two guest cabins each have generous ensuites, the port guest ensuite also acts as a day head. 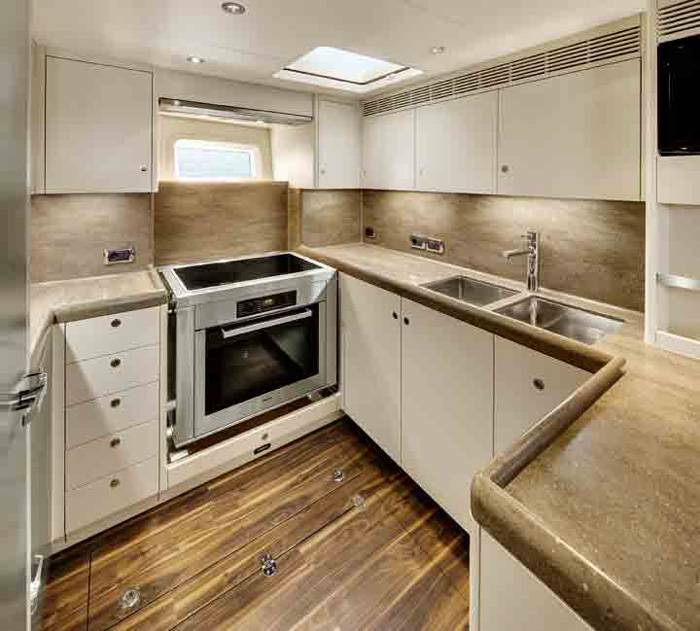 The galley to starboard features corian bench surfaces, generous storage, a large stand up fridge/freezer, and a large custom made under floor freezer. 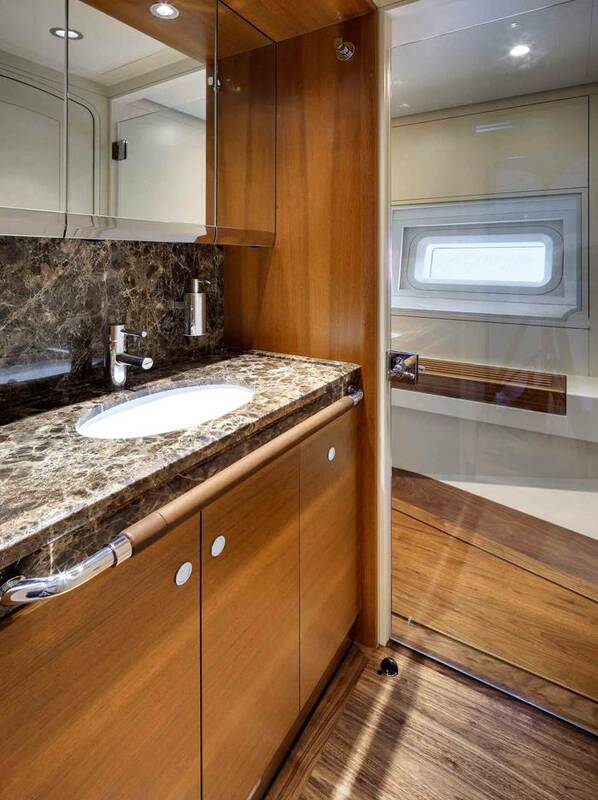 Adjacent to the galley, to port, is the crew mess area which includes deck access and laundry. The crew area is built to the same high standard of finish as the rest of the vessel with the addition of industrial synthetic flooring. The captain’s cabin is to starboard, the crew twin berth cabin is to port, and both have generous ensuites and overhead storage. 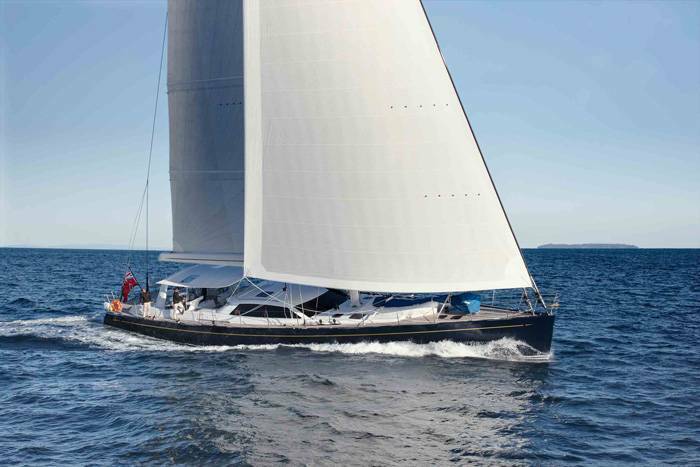 The vessel sports a state of the art keel stepped carbon fibre mast, carbon fibre furling boom and carbon fibre standing rigging, all geared around enhanced sailing performance. 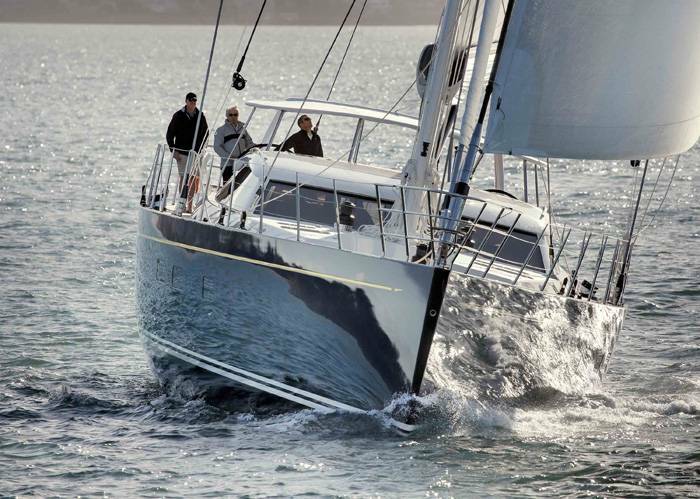 The mainsheet is attached to an arch aft keeping the mainsheet clear of the passengers and crew. The sails and mast were custom built in New Zealand. 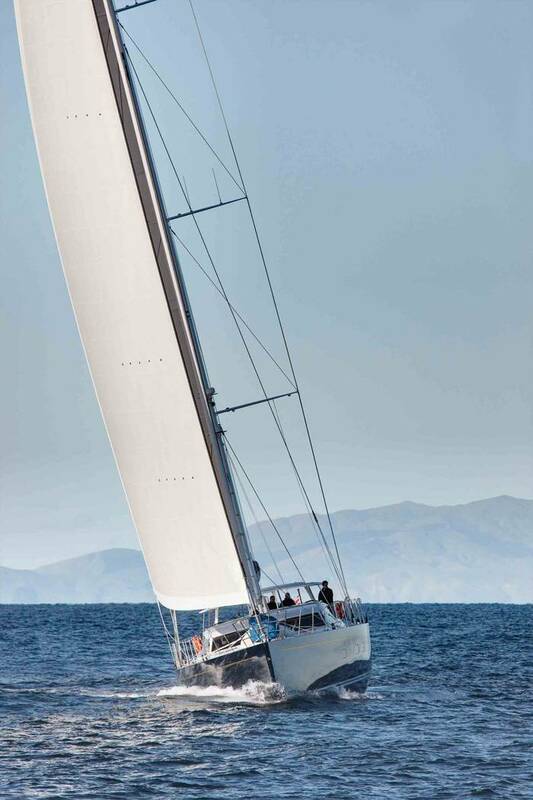 The generous sail plan gives an upwind area of 453m2 and a downwind of 800m2. 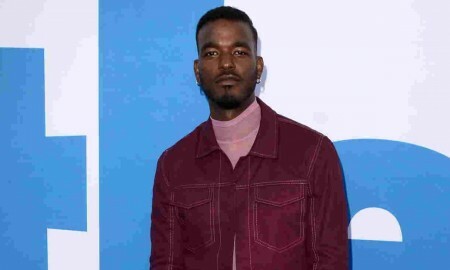 The owner and crew were extremely happy with the vessels performance. 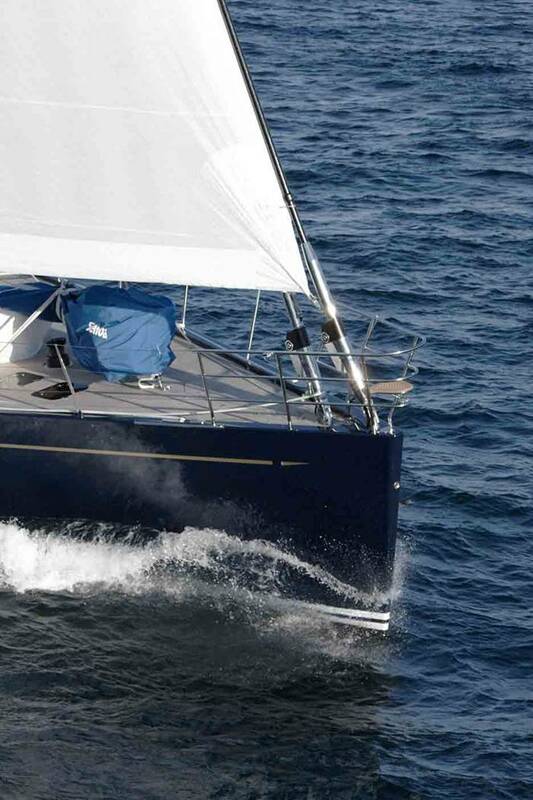 Under power Antares III cruises at 11 knots with a motoring range of 3,600nm at this speed. 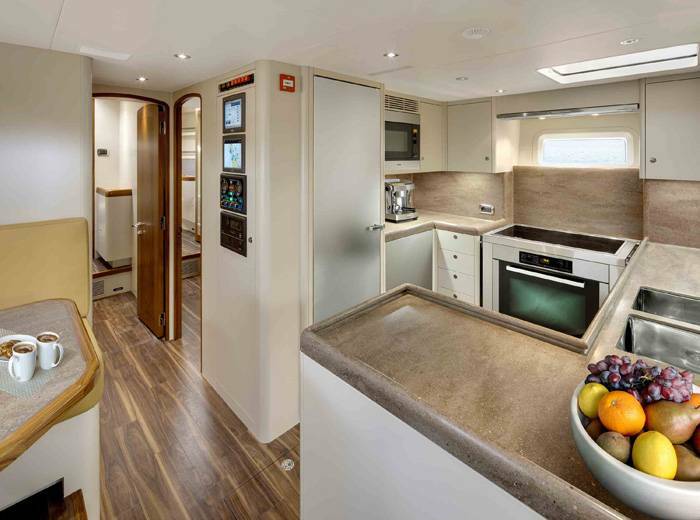 The engine room is impressive; it features full headroom and is located under the pilothouse. The engine room can be accessed from the port side deck and internal access is via a watertight door to starboard of the aft companionway. Access to the pump room forward is via a forward watertight door. 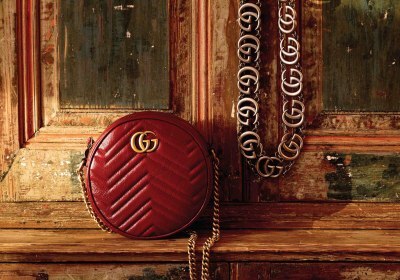 The well presented pump room is located under the lower saloon. 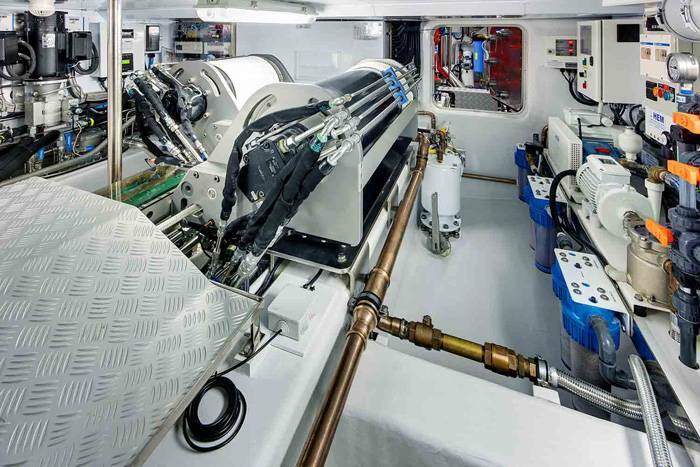 The pump room houses main halyard and mainsheet captive winches, water purification units and pumps. Access is via the Engine room and crew area. 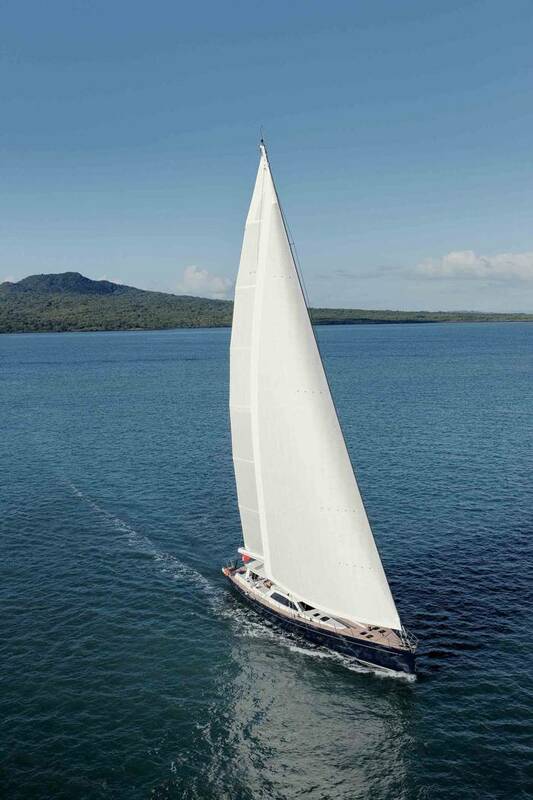 Antares III was handed over to her owner 2 weeks after launching; the vessel is currently on her maiden voyage cruising throughout the South Pacific.